Welcome to the last day (Day #10) of Chocolate and the Wild West Theme Week, and Day #3 of Chocolate and Peanuts Theme Week. Today's entry includes two chocolate items with peanuts, recently purchased in Rapid City, South Dakota—a part of the country known for its wide open spaces, the Badlands, Black Hills, towns like Deadwood, and in some cases ranches with cowboys who aren't just all hat and no cattle. Peanut Butter Cups. H.B. Reese is credited with inventing this confection in 1928. Reese's Peanut Butter Cups (The Hershey Company) are a prominent feature of the American (and global) candy landscape. What's not to like? A dark chocolate peanut butter cup bar? Sign me up. 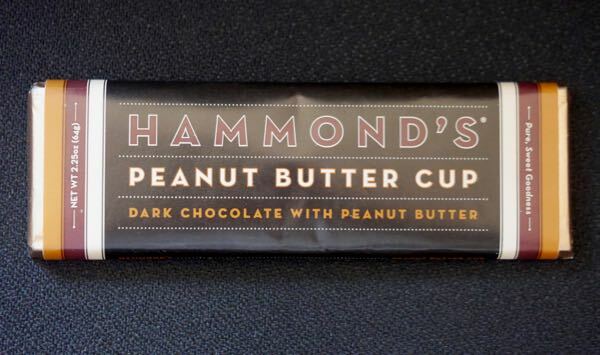 Today's Peanut Butter Cup bar was made for Hammond's Candies (Denver, CO), a company that has been in the sweets business since the 1920s. The dark chocolate bar contained a soft peanut butter filling. I would have liked the dark chocolate to have been a little richer and darker, but it was a good rendition of a classic pairing. Today's Half-Dipped Squares were made for Cabela's—an outdoor sportsman's paradise of a retail location. Beneath Cabela's vaulted ceilings lie stuffed game and hunting, fishing and camping equipment galore. A reflection of the wild west in its present day form. 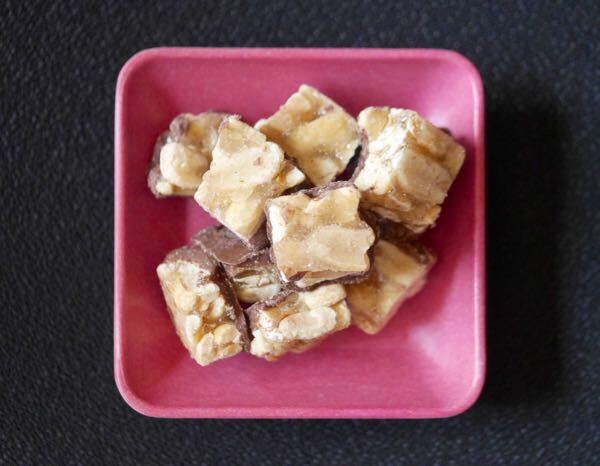 These small squares were made of a sweet, peanut crunch brittle and were coated with chocolate on one side. They were also very similar to an Uncle Buck's peanut squares item found a few years ago in a Bass Pro store (a Cabela's competitor). It's worth noting, the two large outdoor stores have recently agreed to merge; so one of these lines may eventually also be merged with the other.